The MEOP data portal distributes currently two different databases: the MEOP-CTD database and MEOP-TDR database. 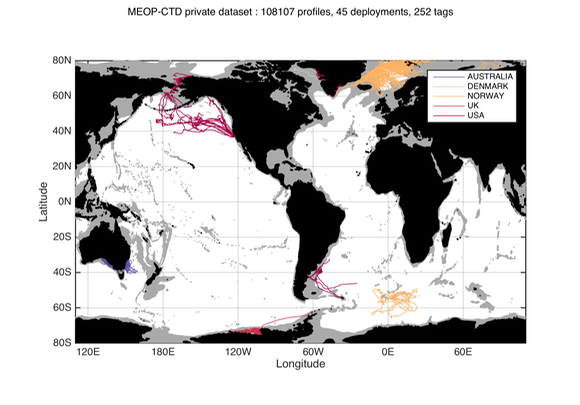 Note that about 80% of the MEOP-CTD database is publicly available from this portal. The remaining data are still private, meaning that their owner have not accepted to share them unconditionally. Private data can still be accessed upon motivated request. The spatial distribution of public and private data is provided below. To download the public data, you have to fill in a simple form following this link, asking for your name, email, who you are and what you plan to do with the data. You will then access a page with the links to the data. The MEOP-CTD and MEOP-TDR public databases can be accessed a zip file. The MEOP-CTD public database can also be accessed as a read-only GoogleDrive folder. Note that data can also be accessed from SEANOE (doi: 10.17882/45461). 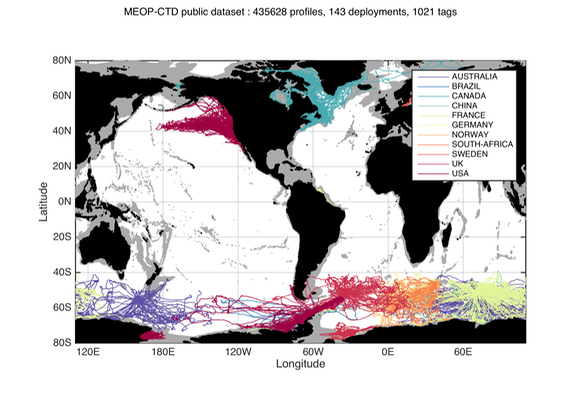 Some of the MEOP-CTD data are not yet publicly available, especially amongst the most recent deployments. It is still possible to request them on an individual basis. The spatial distribution of private data is shown below. Please contact us if you are interested providing an account of why and how you would like to use the data.